Also called “Summer Slump,” the Summer Slide refers to the phenomenon of children forgetting information they learned in school during summer vacation. This learning loss sets students back, not only making the next school year harder, but can have long-reaching negative effects to a child’s overall success in school. 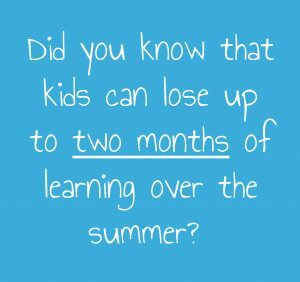 An article by Johns Hopkins University states that most youth lose about two months of learning and that "a child’s summer learning experiences during his or her elementary school years can impact whether that child ultimately earns a high school diploma and continues on to college." A little bit of reading every day can have major impact. Kids don’t have to read a 300 page novel every day. Simple reading, such as the back of a cereal box, a magazine, or a recipe will help kids keep up with their skills. Additionally, reading together for a little while every day has long-lasting benefits. Try reading a book before bed as a way to wind down and improve those literacy skills. If your child is a beginning reader or is struggling, take some of the pressure off by taking turns each reading a page. Even reading aloud to children and teens helps keep up their skills. Connect what they are reading to their lives. If the children in your life, whether you’re a parent or caregiver, is interested in a specific topic or activity, delve into it through books. For example, if your kid is into Legos, then books about Legos would be a good place to start. It could be a “how-to-build” sort of Lego book, or it could be one of the hundreds of Lego franchise books about Lego Star Wars, Ninjago, or Lego Batman. If your child already has the interest, you won’t have to push too hard to get them to read about something they are already obsessed with. Make it fun. There are all kinds of ways to maintain and improve reading achievement while also having a good time. Try playing board games such as Scrabble, UpWords, or Bananagrams. Word-search and crossword puzzle books are also that sneaky sort of educational activity where a kid has fun without realizing that they are learning, too. Check your neighborhood SLPL location to see which board games are available to use. Did you know you can even check out toys from SLPL and take them home, just like books? Browse our toy catalog here. Summer vacation offers a unique opportunity for children to learn in environments that are different from their classrooms, and through different methods. Summer learning can be very different, refreshing, and fun for children. And The St. Louis Public Library can help make it easy. Summer Reading Club starts on June 3rd and goes through August 4th. The theme this year is “Libraries Rock!” Children who complete the program (by reading 8 books) earn a prize pack that includes tickets to fun experiences around St. Louis, such as the Missouri Botanical Garden, The Magic House (kids only), and a Cardinals baseball game. It is absolutely FREE to participate. For more information, please click here. We’ve got books. This sounds obvious, but really, SLPL’s collection is extensive. Are your kids really into Marvel Super Heroes right now? We've got you covered, with books ranging from baby board books to teen books and comics. Do your campers absolutely adore animals? We have non-fiction books and story books concerning animals of all kinds, both mythological and real. If you’re not sure which books your kids would like, check out our Parents Site for inspiration. ABCMouse.com is free at all SLPL locations (in-library use only). If you’re looking for a quiet, educational activity for your child while you also get some work/reading done, show your child ABCMouse.com. This easy-to-use digital education program is leveled by age and offers rewards to keep kids motivated. Just be sure to bring some headphones, so kids can do the wide range of activities offered. Audiobooks and Playaways are perfect for all that time spent in transit. Whether you’re on a road trip or just commuting, listening to stories makes the time go by faster (and boosts literacy skills at the same time!). Browse our collections: Playaways, audiobooks. Launchpads are tablets that are pre-loaded with an educational topic, such as math or reading, and are geared toward different grade levels. These tablets have no internet access, and never prompt kids to pay for anything, so you can rest easy when your kids are playing with them.